I do agree that it was a fairly pointless comment I made - although in fairness, pointless comments aren't exactly rare on this site. That bit wasn't a dig. I am one of many that wasn't smart and lost data. I got smart and now backup, it's simple advice. The dig was "there's always one" and I think fair because the predictable "that's a lot of data to lose" is a fairly pointless comment. Sigh. Yes, I'm well aware that keeping a full backup, ideally multiple, of valuable data is important. In terms of non-valuable data, it'd still be a pain for a single 10TB failure. Quite why people can't respond about the need to backup without making digs like "the smart ones", or the person above making a silly comment about floppy disks, I don't know. Well spotted @Smash77 ! Still waiting on two of these from the last amazing amazon offer, but not yet dispatched. Looking at this deal 'bare bones' could save me £23, but the slightly later delivery window put me off cancelling original order for this. But that was then and this is now, if I hadn't already placed the order I would be throwing my money at this. I wouldn't let the warranty/return issues put you off too much because I have found their UK return service (including the online support) excellent and they never ask pedantic questions like proof of purchase. Just make sure you register the purchase on their website with the date of purchase and you will have 3 years worry free. (annoyed) There's always one. Any data storage device, whatever the capacity, can die on you for a hundred different reasons, and they often do. The smart ones have at least one full backup of ALL of their valued data so if a drive malfunctions they can rest easy. Edit: looks like it's back up to £199 used only. Great little drive. This has a 2.5" drive within it and therefore is USB powered. Good for data backups and using it as xbox or ps4 drive to store games. £22 per Tb seems good to me. Used WD for years and swear by them, especially over Seagate which are often listed on here and are price competitive. As with all things though, a couple lucky or unlucky experiences give people opposing views. These guys do a great job producing stats of drive failures used in there data centre, which generally shows that no brand is truly reliable but drives are getting more reliable year-on-year. My advice would be if it’s a good price, with a good warranty then I wouldn’t worry too much about who swears by what, or who calls what the hellspawn of drives and just buy it. Ofc topic slightly but has anyone stripped the drive out if these to run in another machine or server? Is it possible to do so or is it best left in the enclosure? I wonder if WD can decrypt returns? Fyi MyBook has hardware encryption. Great for security, but this means if the drives goes faulty, your data could be stuck on the drive, inaccessible. Isn't it better to get the mybook for £101 due to the extra year's warranty? Currently no such thing as a WD RED 12TB drive. 2 * 6Tb which isn't that great a deal. Not sure why cold, great price, brilliant for backup!! 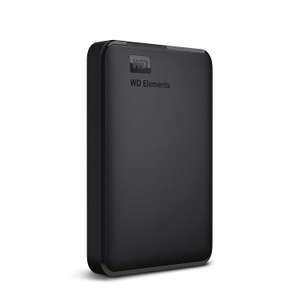 Ignorant question here, but is it possible to just use it as normal storage/portable HDD? Ordered this and UPS driver could not locate my address so instead of calling me (phone number was on package) send it back to Netherlands. Now I have to wait 7 days for refund. Presumably this can be formatted for Xbox right? Anyone got a large WD they want to place. I have a 25% off code, once only for new products. The link is not working now either. You can put the device in a different location portfoward port 80 and 8080 and sync them together using a DDNS if you dont have a static IP. Works perfectly for me. Better off for the sake of £17 I have one on order. Only the one drive. I’m sure the backup software won’t back up all 8tb of this. It’s a lot of data to lose if the hard drive stops working. Well I've got a 250gb wd green that works just fine and isn't "slow" as indicated by your opinion. I complained about my order twice, once when cancelled and once when they still had a charge on my credit card. 2nd time was asked for a number or to ring in. Anyway, finally got to talk to Alex (think she is a manager in customer services. What happened was the supplier miss priced the drives and offered vast stock volumes. Hence stock limit didn't kick in etc. I ordered 4 4tb ultra drives but she offered 2 saying that was the BT good gesture limit. Tried to haggle for 3 but was adamant that 2 was the limit, otherwise nothing as no pursuit of a claim would win. So still pleased 2 4tb ultras for £100 is a deal. She also let slip that she was dealing with 1600+ orders and some comedians had ordered 100's. So anyway, for those who ordered, well worth complaining as they are honouring with up to 2 drives. Yeah BTshop, I think they gave me it because I put in the dispute about them saying the drive was discontinued which was clearly not true. It's only a £15 off a £50 spend voucher though. Who was the voucher from? BT? How much was it for? Open a paypal dispute, I did as soon as they cancelled my order stating they were discontinued. Got refunded the next day plus a voucher. 2TB hard drive for £18.70 price error? https://shop.bt.com/products/seagate-2tb-desktop-sshd-7200rpm-sata-6gb-s-64mb-3-5--8gb-ssd-cache-c-8XSM.html EDIT. Wow that's rubbish. "More than 50 in stock" then "Discontinued item" at checkout. No. I mean, yes, you can store things on it, but for backups you’re better off with larger drives. 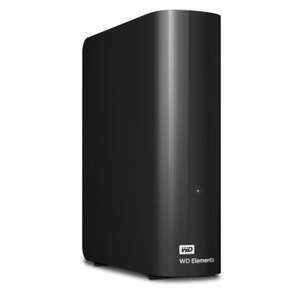 These are fast small drives ideal to install the system files of Windows, Mac or Linux to make it faster to boot and respond. Are they any good for a backup drive of family photos??? 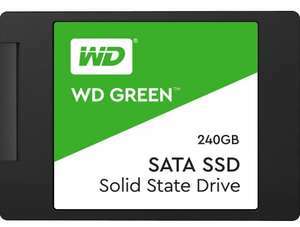 Western Digital WDS240G2G0A WD 240 GB Internal SSD 2.5 Inch SATA, Green Possibly Prime only? Does this actually work? I know the student one doesn't as i tried that already. Their Cart is absolutely broken. It's £152 and you could use the £5 off code. Not bad but £52 more for 2TB more. (highfive) Now you're confusing me on which deal is nice. One is nice and the other is nicer shall we say. It looks they forgot to update prices of used drives, so if still intereseted I would buy asap . The 2 Like New ones I ordered arrived today from Amazon France. The outer boxes were a bit battered and taped up but the drives inside are brand new with cellophane still on. They both register as 3.63 TB so definitely 4 TB drives. Very happy for just over £50 each with a 12 month guarantee. How were Amazon customer services when you spoke/emailed to them about it? Somebody has clearly done the switch on them hard drives. They have sent me return codes for doddle. 12 miles from me. What a waste of time and money. I will be sticking with the new ones. The My Book desktop hard drive is designed to complement your personal style with a massive amount of space to store your photos, videos, music and documents. Just select BT , who ever got my resolver complaint, then forwarded to Head of Bt Shop Just mentioned i was charged , and that my email order stated i would not be , and this is in their terms and conditions, and based on this they had entered into a contract to supply the goods, Also the time i had wasted along with their misleading reasons for cancelling. BT Shop is not an available retailer in Resolver, did you use BT? Have you used any particular template/argument to get a positive reply to your query? 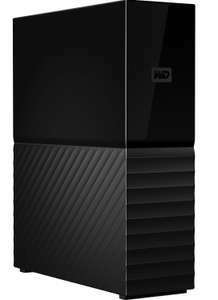 Anyone received a WD Elements Desktop? My order has been dispatched... haven't got it yet though. Fingers crossed. Has anyone got a WD Elements Desktop delivered? I ordered the 6TB version, showing as canceled (twice), but I’ve not received any cancellation email. Currently the white one is £27.99. If your order is more than (I think £45 or) £50 you can get £5 off with the code 5OFF1UK. They will probably be gone soon. Yeah OOS, sorry about that.